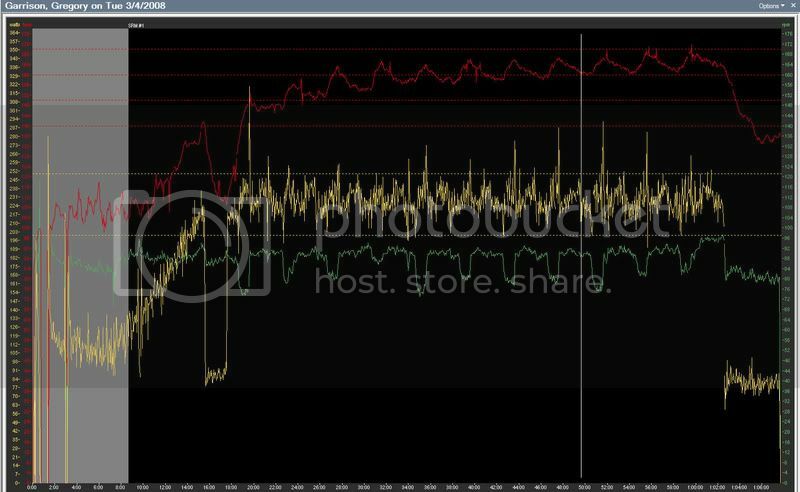 Does anyone have comments that they wish to offer on the RacerMate CompuTrainer? They have a special promotion with $200 off, free $100 course video, and you pay for it over one year. I am thinking about buying one. Thanks. We have them at our sports institute and I spent many a Tuesday lunch hour on them last season. They're cruel mistresses. Very cruel mistresses. When you set the load for a certain wattage, the computrainer will compensate for variations in cadence (speed) to ensure you're working the correct load. There's no escaping those 300w intervals on that thing. The 3d course thing is kind of neat too, a few guys used it to train for the sugarloaf road race last year. But, if you already own a trainer, you may be better off just buying a power meter. When you set the load for a certain wattage, the computrainer will compensate for variations in cadence (speed) to ensure you're working the correct load. There's no escaping intervals on that thing. One of the main advantages of a Computrainer over a normal trainer and powertap is that the computrainer applies the load instead of the just measuring the load. Noncompliance becomes a real problem when a tired athlete is requested to hold a high power; it’s much easier to just turn the machine up and observe the suffering. Intervals become more of a pass/fail issue; just like trying to hang on during a vicious attack. When my old unit finally dies I will get another one. I have had a CT for two seasons and love the consistency and quality of the workouts. I had a trainer and an SRM prior but doing VO2 interval, Microburst or Tempo you always had the ability to fall off on power or effort. The CT does not allow you to do that. It keeps you where you are suppose to be training at. Because the quality is good you don't have to do more. An hour long tempo ride produces much better results, (IMO), that a two hour tempo outside with all the stopping, starting, up and down grades. Here are some examples of the precise workouts you can get from a CT. The Computrainer is by far the best winter training tool out there. Keeps things interesting during the winter. The 3D software is nice and lets you do rides and if someone has created a course for a specific race or ride, you can "preride" it on the computrainer. Its not as flashy as the Tacx 3d software but the computrainer software works and most courses made on the internet are for computrainer. Also think of it as an investment. My buddy has had his unit forever and still works. I would probably sell one of my bikes before selling my computrainer. I used to have one of the old ones that went thru a Nintendo unit and you plugged it into a TV set. It was a really awesome tool for the winter. However, I never wanted to touch it 7 months out of the year because I wanted to be outside. I guess that's same with any trainer. It's certainly the best trainer on the market, and also one of the most expensive. Now lets assume two scenerios, one you spend the next three months doing disciplined training sessions on a good fluid trainer. Two...you spend next three months doing same on a Computrainer. Will you really be all that much better in three months from Computrainer versus fluid trainer? I'd suggest you would get very good results from both. The advantage of the Computrainer is that your training would be a bit more interesting, and you'd have quantified data that you would not get otherwise. I think the 'more interesting training' advantage would be minimal because many hours on 'any' indoor trainer is never really interesting at all....even with the data and the visual experience of the computrainer. I'd also add, if what you are currently doing is not getting you near the front of the races, and on podiums, then I doubt the computrainer will do it either. But, if you have the money to spend...I'm certain it will be a good tool, and you'll certainly get many years of use from it. It'll be great to have on those cold winter days when you can't get out on the roads. I purchased one about three months ago. So far I have seen my W/KG shoot up and my resting HR lower to 39 BPM. This is the first winter that I am actually LOSING weight!